Very often we’ll receive Google search alerts about yet another ambitious new tech start-up promising to completely disrupt real estate brokerage. Usually, it will be a press release self-promoting another bold, young entrepreneur with zero real estate experience promising to become the Uber of real estate. 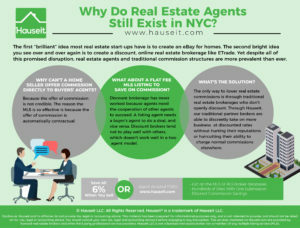 Yet despite all of this promised disruption, why do real estate agents still exist in NYC? What they fail to understand is that even though home buyers start their search online, they almost always end up working with a buyer’s agent. 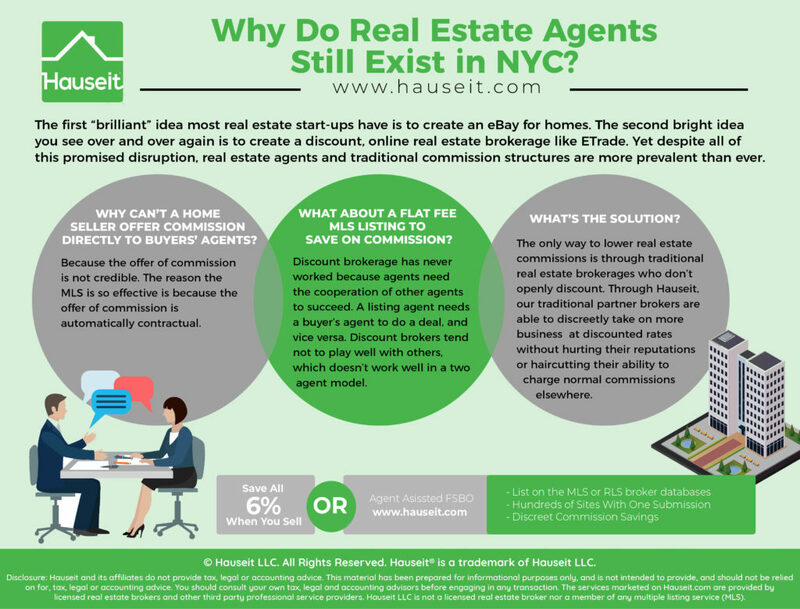 Among the 5,000 yearly real estate transactions in NYC, 90% of deals are completed between a listing agent and a buyer’s agent. How does this happen? For starters, one must realize that almost all inventory is controlled by listing agents. In NYC, over 96% of listings are for sale by agent vs 4% that are listed for sale by owner. As a result, as soon as a new home buyer starts searching online, he will invariably begin speaking with listing agents. Now, remember that every listing agent is a potential buyer’s agent on another property. In case the home buyer isn’t interested in his listing, the listing agent will invariably pitch his services as a buyer’s agent. This agent and every other agent the home buyer comes in contact with will explain to the home buyer that real estate commissions are always paid by the seller and that working with a buyer’s agent is free. They’ll explain that the commission is a fixed amount regardless if the buyer is represented or not. As a result, the buyer will be throwing away free advice and representation by not working with a buyer’s agent. “The commission is built into the sales price, so if you’re paying for representation anyway, why not use it?” is the common refrain from veteran real estate buyers’ agents. It’s not difficult to understand why most home buyers end up choosing to work with a buyer’s agent. No one likes to throw away a service they’ve in effect already paid for. Moreover, what first time home buyer will turn away free advice and guidance for the biggest purchase of their lifetime? Moreover, real estate agents are collectively the biggest sales force on the planet. There are 30,000 licensed real estate agents in Manhattan alone and over 50,000 in all 5 NYC boroughs. These agents will be friends you meet at parties and neighbors you bump into on the elevator. These will be people you turn to for free advice before even beginning your home search. How likely is it that a home buyer will turn down free help from a real estate agent friend after learning that it’s a free? However, the fact that most home buyers end up being represented by buyers’ agents is not good news for home sellers hoping to avoid paying the standard 6% broker commission to sell their home. As a result, because 90% of home buyers are represented by agents, no public real estate search website can ever hope to monopolize the buyer market. Not only is this true for giant search websites like Zillow but laughably even more so for the wannabe disruptors creating the next eBay for homes. 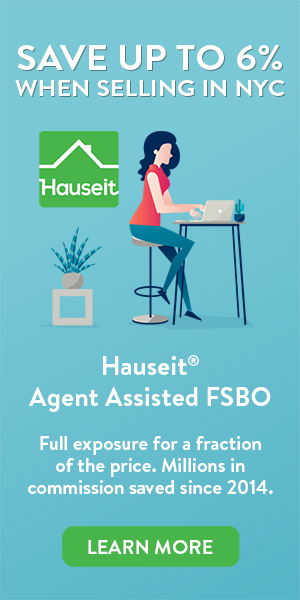 Home sellers can save up to all 6% in broker commissions through an Agent Managed FSBO listing. Home sellers are paired with a traditional, REBNY Member Firm who will list their home on the RLS and other popular search websites such as StreetEasy, Zillow, Trulia and Brownstoner for a small, one-time flat fee. Homeowners maintain full control of the sales process and handle all scheduling, showings and negotiation. Home sellers can avoid broker commissions altogether if they find an unrepresented buyer. If home sellers close with a represented buyer, they will only owe whatever commission they offered in RLS to buyers’ agents. Home buyers can save on their purchase as well through a broker commission rebate. You can legally receive a portion of the commission earned by your buyer’s agent which can help cover your closing costs.